The SteamMax steam cleaner is one of the popular steam cleaners available on the market today. 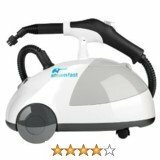 This steamer is a product of Steamfast and therefore belongs to a series of other Steamfast steam cleaners which generally enjoy high customer ratings and feedback. 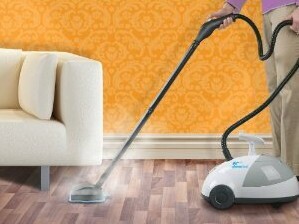 The Steammax SF-275 as it is known by model code is not a an ordinary steam cleaner. It is superior to most average steam cleaners as a result of its high steam temperature which gets closer to that of vapor steam cleaners. Whilst being inferior to advanced and more sophisticated dry vapor steamers such as Ladybug steamers and Vapamore, the steammax has often been a strong viable alternative to these pricey high temperature steamers. 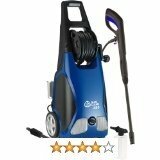 It has a wattage of 1500w which is very high compared to most steam cleaner wattage including handheld steamers. This steammax steam cleaner is therefore on the high end in terms of steam temperature produced. It also is a pressurized steamer. It falls into the category of high pressure steam cleaners such as the McCulloch MC-1275 steamer and the Bissell 39N7A Steam Shot. Mimicking the pressure washers, the Steammax SF-275 steam cleaner has an operating pressure that can reach as high as 65psi according to manufacturer lab conditions. In reality, however, some independent obviously non-scientific pressure tests by users have given it a maximum pressure of 85psi which is still very high by steamer standards. The controlled steam pressure from the Steammax ranges from low which is 45psi to medium at about 55psi and can also be set to high pressure at 65psi. Due to its high pressure and high temperature properties, the Steammax steam cleaner has been an inexpensive alternative for engaging in some serious home cleaning projects. With its properties akin to those found on actual vapor steamers, this Steammax can remove wallpaper, do your bathrooms, do your car engine steaming, clean windows, remove dirt and stuck-on stains, kitchens and toilets. There has however been some pockets of complaints about its effectiveness on windows. This is a comparatively powerful steamer which can also remove grease, scum, oil, mildew and other stubborn dirt particles. It has been used with satisfactory results by many users for fabric steam cleaning and even upholstery steam clearing. The dry steam that the steamer produces also makes it a very effective sanitizer and disinfecting tool in addition to killing bed bugs and dust mites. In terms of cleaning time, the Steammax steam cleaner will give you up to 2 hours of steaming. This is an environmentally friendly machine using no chemicals except water from your home tap. This water however mustn't be hard water as this will damage the steamer in the medium to long term shortening its life span. Hard water has calcium and other compounds not good for steam cleaners. Expect to also get a range of attachments and accessories shipped together with the steamer. These are for cleaning a variety of surfaces around your home. Examples include brushes for corners, a scrub pad, a brass BBQ grill brush, window cleaning attachment, amongst others. As mentioned this steammax steam cleaner has received high ratings and reviews averaging 4 out of 5 stars on most reputable online stores such as Amazon, QVC and Allergy Buyers Club. It has also received a share of complaints and negative reviews and ratings which we now present below in summarized format as PROS and CONS. - steamer is noncontiguous refill, there will be a downtime of about 30 minutes after every 2 hours of cleaning.